CHICAGO – Dwayne Johnson doesn’t just want to be The Rock. And perhaps he is more after all. Despite his professional wrestling fame, “Snitch” is Johnson’s plea to be respected as a true, dramatic actor. He’s doing it now just like Jackie Chan wanted to evolve beyond being just a funny karate man in the latest “The Karate Kid”. “I really thank Will Smith for giving me a chance to act in this film. For a long time, I’ve wanted to show audiences that I’m not a comedian and I’m not an action star. I’m a true actor. An actor can do everything – just like Robert De Niro. I want to be an Asian Robert De Niro,” Jackie Chan told HollywoodChicago.com in 2010 on “The Karate Kid” red carpet. Now Dwayne Johnson is trying to make the same kind of conversion. While he’ll never be taken seriously in films like “The Scorpion King” or “Journey 2: The Mysterious Island,” “Snitch” is a promising peak inside the chops of what this beast of a man can be: perhaps an actually semi-decent actor. Read Adam Fendelman’s full review of “Snitch”. While he’s got no problem getting Hollywood work – Johnson has six feature films already in 2013 – “Snitch” throws him into the role of a vengeful, vigilante father. He attempts to take matters into his own hands when the law sleepily does nothing to rescue his imprisoned son. While the script takes truly compelling material and turns it into often-weak dialogue that escalates down a path you can’t buy into, four things make this film worth it. We have some surprisingly genuine moments by Dwayne Johnson, Barry Pepper steals the talent show as a supporting actor and we feel some authentic tension created by the film’s most important decision of all. “Snitch” stars Dwayne Johnson, Susan Sarandon, Barry Pepper, Jon Bernthal, Benjamin Bratt, Michael Kenneth Williams, Rafi Gavron, Nadine Velazquez, JD Pardo, Melina Kanakaredes, Lela Loren, David Harbour, Harold Perrineau, Kyara Campos and James Allen McCune from writer and director Ric Roman Waugh and writer Justin Haythe. “Snitch,” which has a running time of 112 minutes and opens on Feb. 22, 2013, is rated “PG-13” for drug content and sequences of violence. Continue for Adam Fendelman’s full “Snitch” review. 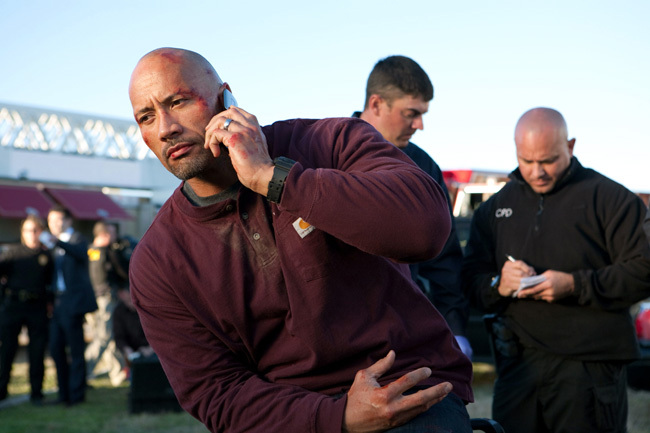 Dwayne Johnson stars in “Snitch”. Submitted by Hannah (not verified) on February 24, 2013 - 12:15am. The more reviews I read of this movie, the more I want to see it. I won’t have time to go see it in the theater, though.